Chromebooks + Benchmark Advance Phonics and Fluency Practice + Screenshots + Seesaw... ALL in FIRST GRADE!?!?! How can K-2 students even log in to a Chromebook? Can young children easily navigate between various resources in a Chrome browser? Why would I teach a first grader how to take a screenshot?!?!? Watch this young scholar, a first grader, in action! What can our littlest learners create on Chromebooks? It has long been thought that iPads are the device that young learners can have the most success with in the classroom. However, young students can do amazing things on Chromebooks, too! In my small district, we’ve been using Chromebooks in K-2 for a while. We started almost six years ago, and while it certainly has taken some time and growing pains throughout our journey, the successes we’ve had have been well worth the effort! We teach students how to log in to the Chromebooks with a unique username and password during the first weeks of Kindergarten. Is it easy? NOPE! It takes time, patience, and repetition. Once our students can get into the Chromebooks, they have access to many resources for learning, creating, and sharing. Our students use content and tools from our adopted curricula as well as tools from Google Suite, Seesaw, Epic Books, Scootpad, Brainpop, and many others. This week, I visited a first grade class during their center/workstation time. The learning goal was to practice vowel teams in words with the Long O sound. The purpose of technology in the activity was to offer additional practice and learning resources, as well as to record the students’ practice of both the phonics skill (blending sounds) as well as record their reading practice to evaluate fluency. The students began by reviewing multiple resources about their phonics skill of the week, Long O vowel teams. 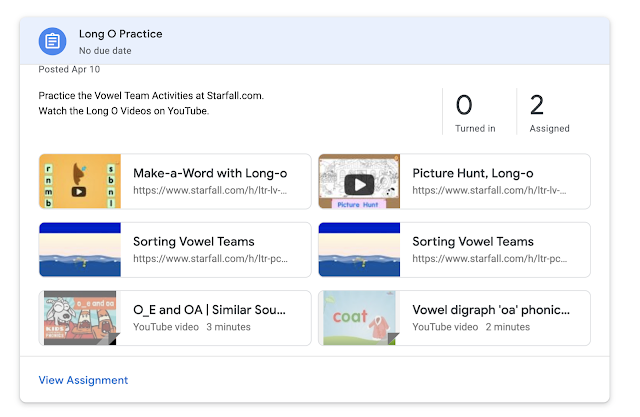 Here, Google Classroom is used to package and share resources such as interactive games at Starfall.com and related videos on YouTube. Next, students complete a phonics/word-building activity using the ePocketChart from our Benchmark Advance ELA program. This simple interface has students building words and sentences using a variety of letter, word, and picture cards. These can either be pre-selected by the teacher, or students can self-select the cards they would like to use. Today’s activity had students building words using the Long O sound using the vowel teams OA and O_E. Once the students completed their word building activity in whichever tool you use, they can use the online tool Seesaw to share and record themselves saying the sounds and words they built. The thinking and beliefs behind the hashtag #K2CanToo center around the importance of empowering our littlest learners. It’s about eliminating the biases about what even very young students CAN do! If there were any doubts about whether young students can do these tasks, Xophia’s video above should certainly be evidence to the contrary. That awesome girl builds words, records her learning, and shares it. The entire task was completed quickly and efficiently. It wasn’t an ordeal or special occasion. You can tell in the video that that this is something she is very confident in accomplishing. In addition to the Benchmark phonics task, in the video the student also shares how a piece of text, such as an online decodable text from your ELA curriculum or a piece of text from a resource such as Epic Books can be captured and shared, too. What’s the big deal about screenshots? 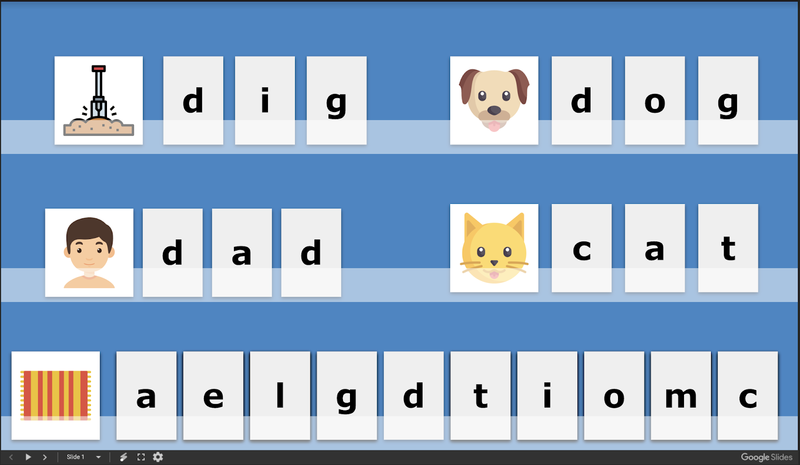 You’ll notice that the student takes a screenshot as part of the phonics activity. Teaching young learners to take a screenshot allows them to capture and share evidence of learning from a wide variety of online resources! Pairing a screenshot with the recording and sharing tools of Seesaw provides opportunities for voice and audience. The potential becomes limitless! If your young learners haven't yet mastered this task, here is a great visual created by Wanda Terral to help you get started. How does technology enhance this task? The students certainly could have completed parts of this task without technology. They could have worked on a similar word-building activity using letter tiles or flashcards. They could have read the paper copy of decodable text that goes with the phonics lesson. Completing the tasks on the Chromebook added many additional layers that benefitted the student and the teacher! Management: Using the online tools, the teacher can assign the letter/phonics items digitally. This eliminates the burden of having to find and organize flashcards, and also the need to clean up the flashcards after each group of students use them. If students have device and network access from home, the online versions of these tasks could also be completed at home, without having to send additional materials that could get lost. Supporting the needs of Diverse Learners: By providing a variety of digital resources, we’re able to give many students opportunities to access the learning over and over again. They can replay the videos and lessons and practice the games many times. The visuals and images included with the digital resources add an additional layer of support. Accountability: If a student center/workshop activity is to use flashcards or letter tiles to build words and reinforce a particular phonics rule, there is often no final product that they can be held accountable for. Having kids turn in their digital content holds them accountable for the activity, while also giving the teacher the opportunity to do some formative assessment. 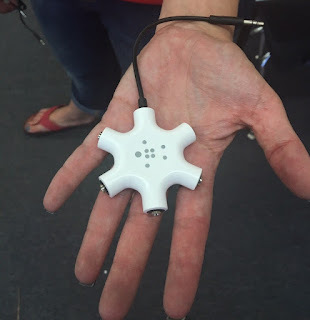 Audio Recordings: The ability to hear the students’ practice with blending or segmenting words and sounds gives a window into their learning that we wouldn’t be able to capture if the students were not using the digital tools. Sharing: It’s a widely known truth that students will often put extra effort into an activity when they will be sharing it to an audience. Publishing student learning to Seesaw allows their peers and parents to see the activity, too. What a great opportunity to make home-school connections! Is the activity educationally sound? Does it enhance student learning? Does it make the teacher’s job easier? Is there a meaningful product? Adding technology to our phonics lesson clearly evolved that traditional task. Our littlest learners can accomplish amazing things when we give them access to modern tools and meaningful opportunities to SHOW us what they know! Learn more about what young learners can do at my website, PrimarilyGoogle.Rocks. #K2CanToo - Design Thinking in First Grade: Tiny Tinkerers Solving Problems! As a part of the Benchmark Advance ELA unit on technology, our first graders have been exploring how technology helps us. They have read a number of texts that share about inventors and their cool inventions. They have also read how these inventions make our lives better and easier. Some examples have included how technology can help people who can't walk, how technology helps farmers grow and process our food, and how technology helps us communicate. We watched a Brain Pop Jr. Video on design and engineering. It told us that you need to understand your problem and who it impacts. It showed to brainstorm ideas and then make a plan, and emphasized the point that your first plan doesn't always work! We took a dive into Design Thinking together, and they helped me solve one of my biggest problems: having TOO MANY DISHES to wash! We had some conversation with partners to better understand the problem, and then together, we planned out the design of a dish-washing robot! They decided he needed a soap dispenser, a blow dryer, a scrubby wand, and most importantly, to be WATERPROOF! Then, the kiddos thought of a problem in their life that needed to be solved. They came up with so many important problems! Some needed help cleaning, some needed homework help. One wanted a friend to play video games with him, and another needed help training to be a pro-football player! There were even a couple kids who said their biggest problem was having to clean up after their dog. Who wouldn’t want a robot to do that dirty job?!?! We drew out our first plan on whiteboards, and then talked to partners about why our problem matters and to get feedback about how our design might be better. We improved our plan and then made our next version on a piece of paper. We colored our robots and event got to make it fancy by adding diode lights and button cell batteries. We didn't have time to actually model or build prototypes, but the kids had a great time exploring the process! Then, we took a picture on Seesaw. Each student made a recording to describe what their problem was, and how the robot they designed could help solve that problem. Click to LISTEN to what these FIRST GRADERS have to say! Let's celebrate the amazing leaders from our nation's past in this collection of Googley Fun Presidents' Day resources and activities for young learners. Are you using Epic yet? Epic Books offers FREE! FREE! FREE! 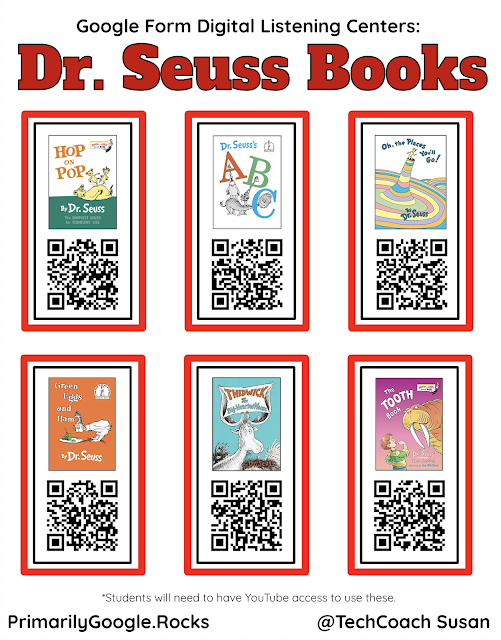 digital text for teachers and students in the classroom. They have thousands of high quality books for students to access on most any device with internet access. It's so user friendly and appropriate for even very young children. My favorite part about using Epic with young learners is that they have a number of Read-to-Me texts that read books aloud while tracking the words on the page. There are also many audio-only books too! If you haven't tried Epic yet, hurry over there and sign up for your free teacher account. A bonus: If you already have a Google Classroom set up, you can import your class and create all of your student Epic profiles in just a couple of clicks! This President's Day Hyperdoc created in Google Slides has young learners explore, create, and SHARE! Remember to make your own copy by pressing "Use Template" in the upper right hand corner. This will make a copy of this file in your Google Drive! Modify and REMIX your new copy to best meet the needs of your students. Delete pages, add pages, substitute tools and activities... make it your own! Then share your copy to your students using Google Classroom or whatever tool you use to distribute content to your students. 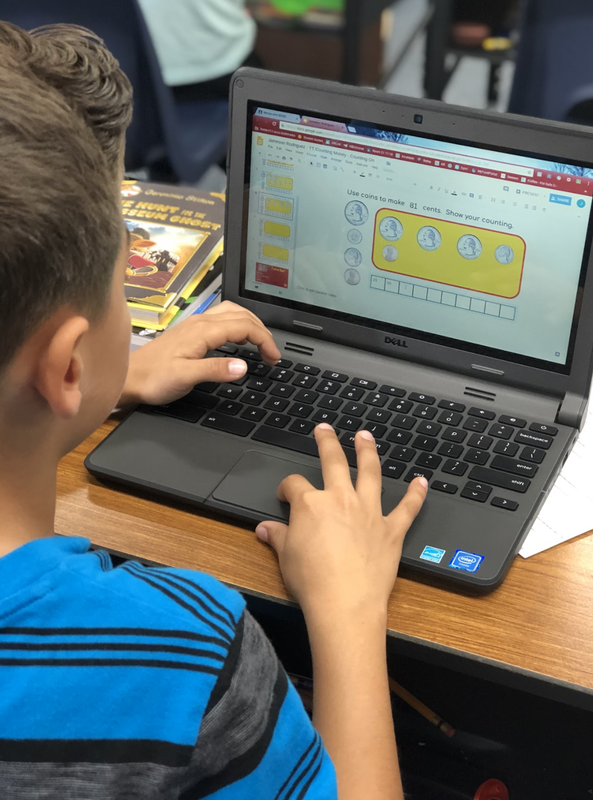 Learn more about Hyperdocs and the Teachers Give Teachers Community! 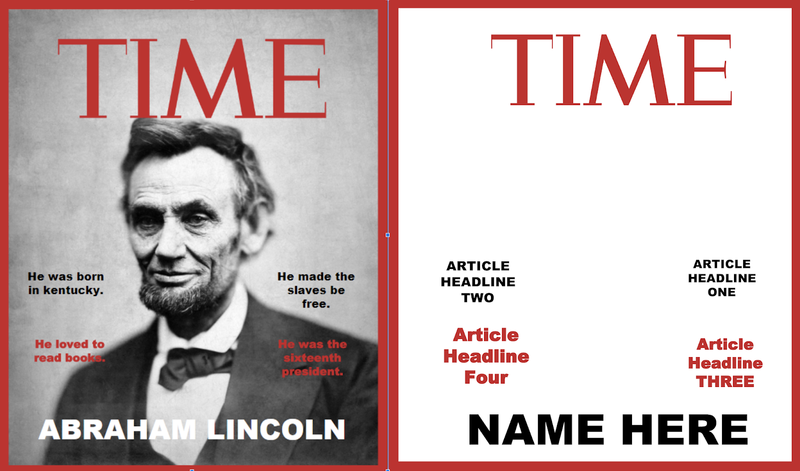 Find key details from the informational text about a president and use the facts as snippets on the front of this Time Magazine Cover created in Google Drawings, inspired by the work of Ryan O'Donnell (@CreativeEdTech). Check out more of Ryan's templates! Make a copy of the template and share to students in Google Classroom so that each student gets a copy. These Google Form Digital Listening Centers can be shared with students in Google Classroom or any other way you share a link to your students. I also have printable QR codes for each of these Forms below. These forms DO NOT require students to be signed in to their own Google Account, but they will need access to YouTube. I like sharing YouTube videos through Google Forms because the young students can view the YouTube content without going to an actual YouTube page. The standard links below will take your students to my copy of the Form, which will allow them to watch the YouTube videos embedded in the Form, while also giving them a chance to cast a vote as to whether or not they liked the book. A summary of overall votes will be accessible after the Form has been submitted. You may also use the additional links labeled below to make your own copy of these Google Forms! By doing this, you'll have access to your own students' votes, as well as have an opportunity to customize the Form by adding questions of your own! One example might be that you may want to add a question to collect your students' names or have them choose their name from a list so you know who completed the activity! Share this link with your students or make your own copy here. 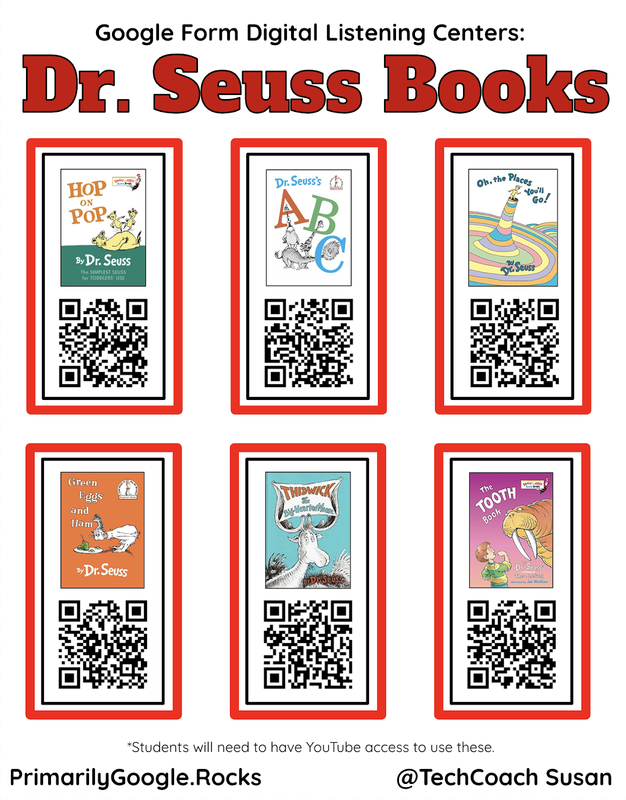 Have QR scanners on your devices? Get these Printable QR codes for Presidents' Day Digital Listening Centers. 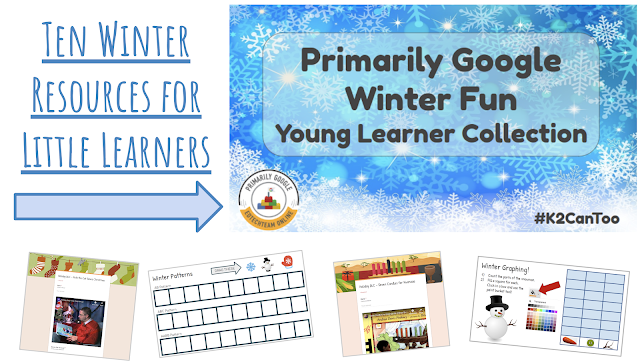 This set of resources designed for young learners was a part of the EdTechTeam 10 Days of Giveaways. Primarily Google is now available as a Just-in-Time course through EdTechTeam Online! 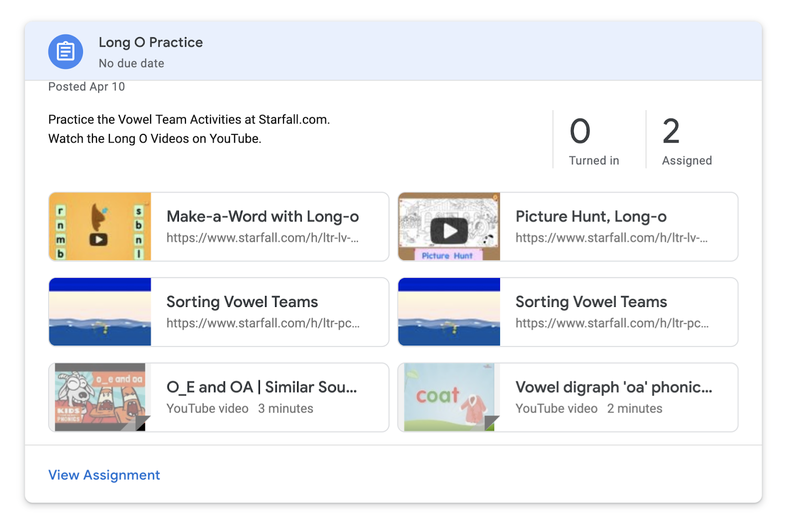 Check out this course designed especially for the teachers of our littlest learners, as well as many other other self-paced learning opportunities at EdTechTeam Online! Register for Primarily Google Online HERE! Counting Money in Second Grade: Google Slides + Seesaw App Smash! The second grade students have been practicing counting coin values! One skill that is especially difficult for younger learners is counting money when there is a combination of coins, because it requires you to change your counting patterns with each coin depending on its value! First you're counting by 10s with the dimes, then you have to shift gears when you get to the pennies! And then we add in nickels and quarters???!?!? Count by 25s. STOP! ADD 10s! STOP! Now add 1s!!! This can be a challenge, but SO IMPORTANT for young learners to grasp early. It's the kind of mental and conceptual mathematics that will be so much more useful to students than passing any set of timed math sets ever will! 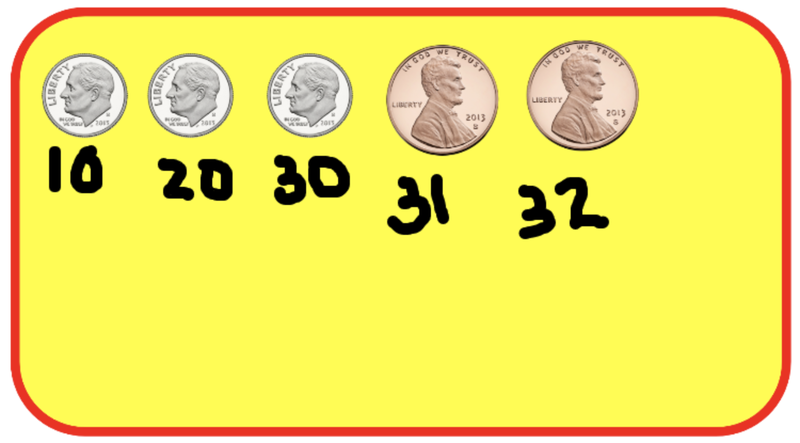 In this activity, second grade students practiced counting combinations of coins with values under $1.00. 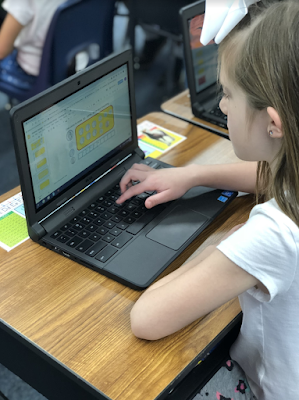 In a short guided lesson, students worked on a set of Google Slides shared in their Google Classroom. One example was modeled by the teacher, and a second example was done as a whole class. Students worked on more examples, pausing to discuss their solution with a partner. They were to describe the coins they used, and then tell how they counted it aloud. Then, they were to compare their solution to the one their partner offered. Did they use the same combination of coins to show the money amount in the same way? Students selected ONE slide from their activity to download as a .JPG. This saved a copy of that page to their Chromebook. This could also be done on an iPad or PC as well. If students know how to take a screenshot, that would be be an alternative way to get an image of their work. These might seem like complicated tasks, but once you show them how, even very young students CAN do this. Show them the steps and practice together a few times! Make Math Thinking Visible AND Audible! Once the students downloaded their picture, we headed over to Seesaw.me! 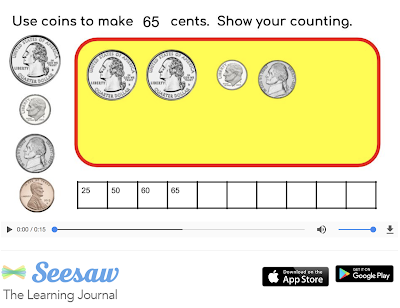 Students added their image to a Seesaw post and used the voice recording tool to describe their coins and how they counted them. Once they had shared their learning to Seesaw, students could review the work created by all of their peers in the classroom and leave feedback for each other! This allowed students an opportunity to compare their solution to the solutions that other students came up with! Also, because parents are connected to the students' Seesaw accounts, they too were able to view and leave feedback for the classroom math activity. This powerful home-school connection gives parents a view into the classroom and shows them how to appropriately reinforce the math concepts at home. Learn one technology skill at a time. This App Smash was possible because these students were already very familiar with Google Classroom, Google Slides, and Seesaw. They have used each of the digital tools in isolation a number of times. This activity is definitely NOT a starting place. Keep it simple, especially in the beginning! In Seesaw, it takes practice and modeling to show students how to give specific feedback to peers. Explicitly demonstrate how to move beyond comments such as, "I like it!" and "Good Job!" Offer sentence prompts such as, "I agree with you because..." or "Another example might be..."
Get your own copy of the Google Slides templates! 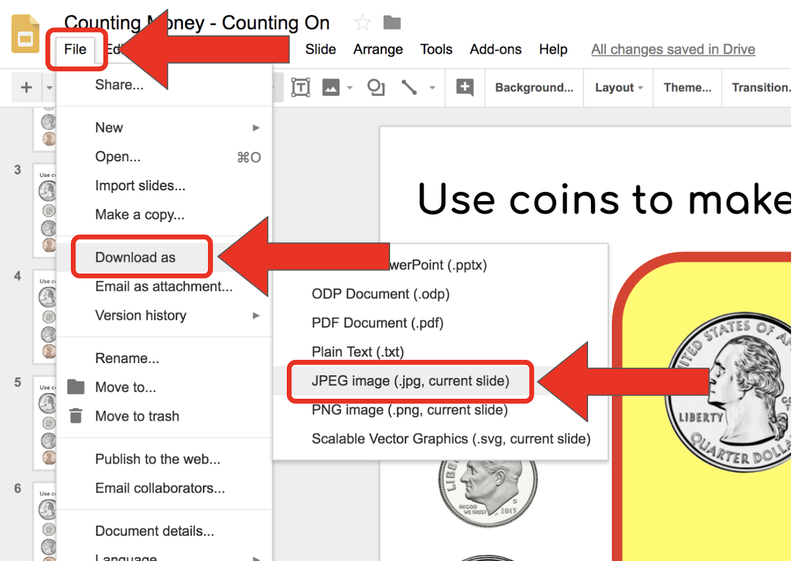 Money counting practice pages for Google Slides. Please feel free to duplicate, change, and pass along to others!